Stories are truly the heart of interpretation. A well-told story is the most powerful way to connect visitors to your organization's mission and inspire conservation action. Whether stories are part of a tour, program, presentation, or visitor conversation, the skills presented in Interpretation III: Storytelling will help participants select, develop, and deliver message-driven stories that are compelling, enjoyable, meaningful, and memorable. Participants who have successfully completed Interpretation Basics: Module I and II have learned the principles of interpretation and how to develop and deliver interpretive tours, presentations, and visitor interactions that are relevant, meaningful, and fun. In Interpretation III: Storytelling, they'll further develop their interpretive skills as they discover how to tell powerful stories. The module takes participants through a discussion of why stories are an effective communication tool. Participants learn the essential elements of a great story, how to align stories to their organization's key messages, and where to find their stories. Finally, they learn the strategies and techniques for delivering amazing, engaging, and memorable stories. Interactivity sprinkled throughout the module engages participants in the learning process, and questions at the end of each section will ensure that participants have mastered fundamental concepts before they move on. This module takes about 90 minutes to complete, although participants progress at their own pace and may repeat the entire course or sections of the course as many times as they like. The three Interpretation Basics modules can be easily integrated into your current training program. Providing online modules that team members can complete anywhere and at any time overcomes one of the major challenges of training: getting all participants together in one place at one time. At the San Diego Zoo and Safari Park, participants complete the online modules on their own before attending group training programs. They are able to master key vocabulary and concepts, giving them a solid foundation that allows them—and their trainers—to make the most of in-class and on-site training. Please come by and see us at our booth at the upcoming AZA Conference in Salt Lake City. As always, we are very excited to attend the conference and looking forward to the opportunity to talk with everyone about training for zoo and aquarium operations. Debra Erickson, director of Marketing Communications at SDZG, makes significant contributions to the Academy and is also in charge of our new San Diego Zoo Kid’s TV initiative, and she will join us at the booth periodically. Please don’t hesitate to stop by and discuss both of these impactful digital programs. The Academy’s environment is a great way for all of us to collaborate—perhaps your zoo or aquarium interacts with a local hospital that would be excited to be able to offer this children’s programming at their facility. 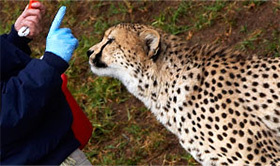 Bringing Smiles to Hospitalized Children: How Zoos Can Help Heal, Sunday, September 20, from 4 to 5:30 p.m. The San Diego Zoo Global Academy Puts Moorpark College in the Spotlight! 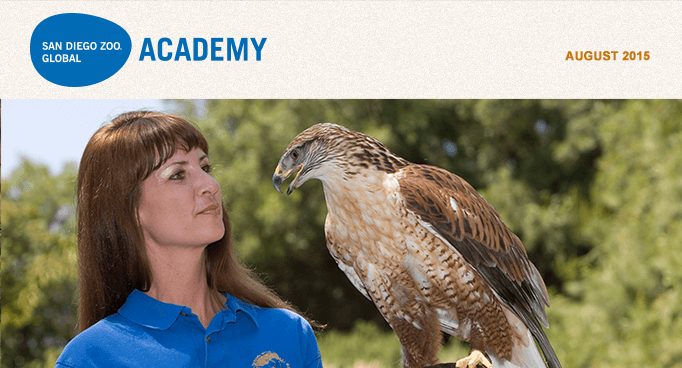 Moorpark College America’s Teaching Zoo—Exotic Animal Training & Management has recently joined the Academy’s collaborative learning environment. Welcome! Please join us for the Administrator’s Users Group Webinar hosted by Academy partner CypherWorx. The next webinar is Wednesday, August 19, 2015, at 11 a.m. PDT. After registering, you will receive a confirmation email containing information about joining the webinar. Academy partner CypherWorx has a new tutorial feature on the Academy platform. The learner can click on the tutorial desired in less time than it would have taken previously. The site administrator can click the reporting tab on the left-side column to report invitees’ attendance (and grade their performance, if applicable). Non-Training Events are events that do not require grading or the awarding of training clock hours. For non-training events, only the attendance or non-attendance of invitees can be recorded. Training Events are events for which the invitees receive a grade of some sort and/or training clock hours for attending. Examples include in-person classroom training events and "live" training events delivered online by an instructor. Words work. Words express. Words can help us to continuously improve and lay the foundation for getting better all the time. The first major animal-related federal submission I worked on in late 1989 and early 1990 included a subtle but meaningful use of words. Those comments (co-authored with the late Edwin S. Gardner V and Joy D. Hampp) conveyed a heartfelt respect for animals, at that time dolphins, by placing dolphins before humans whenever both were referenced together. There was no grand proclamation alerting the reader to this point, but it was important in expressing sensitivity to the animals, and it harmonized with the overall philosophy of that submission. For some years now, the use of the "c" word—"captive" or "captivity"—has been avoided. This is not a matter of spin doctoring or avoiding the ethical challenges and realities of animals maintained in human care. The concept behind the word implies, at least to me, a punitive intent not in evidence among caring, dedicated, and, dare I say it, loving professionals (and volunteers) in the zoological community. Utilizing "in human care" or "in the care of humans" (rather passive, but not a space away from turning into a typo suggesting inhumane care) or other descriptive terms work better. Acknowledging the realities of zoological life while employing these terms actually has an uplifting effect and inspires me to work harder to create improvements. So many words can be put to good use to elevate our compassionate commitment to animals. In my book EXCELLENCE BEYOND COMPLIANCE: Enhancing Animal Welfare Through the Constructive Use of the Animal Welfare Act, outstanding editor Chris Nelson painstakingly helped me lovingly craft each word and idea. Examples include the terms "accrediting associations" and "professional associations or organizations" in lieu of "industry or trade groups"; "zoological organizations" instead of "institutions"; "critics" and other constructive expressions rather than other options that might alienate the public trust or exacerbate conflict. "Caregiver" replaced "caretaker"—although we may take great care with the animals entrusted to us, it seems to evince more proactive concern being a giver of care, and extraordinary care at that. I came to the zoological world from the legal profession. As such, I practice law and now I also coach, mentor, and teach fellow zoological professionals to take their potential to greater heights. Zoological organizations doing good things with and for animals must be economically viable, and doing right by the animals is the best way to make things work. After a lifetime of pro bono as well as compensated efforts on behalf of animals, this service has never been rendered (even when involving private sector clients) within a marine mammal or zoological business or industry. Again, I get the economics, but I am proud to work with caring, dedicated, knowledgeable, and loving professionals, including many inspiring caregivers, in the marine mammal and zoological communities. The word community is perhaps a relic from my land use planner/municipal attorney days, but it sounds right, and it best reflects the spiritual essence of our good work on behalf of animals. Ever-thoughtful consideration of our words is another fun way to challenge ourselves to create a better future. That is truly the magic power of words! — © 2015 James F. Gesualdi, P.C. The opinions expressed herein are solely those of the author. This is not, nor should it be construed as, legal advice. The key concept is that multiple factors are often involved in the outbreak of disease in fish. Where the three circles overlap (see diagram) is the area leading to the development of disease. It is important to explore all potential contributing factors. 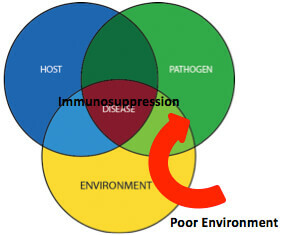 We looked at the Host and Pathogen circle; this month, we look at the Environment. As aquarists, this is the main area over which you have control. Generally a poor environment, for whatever reason, will place the fish under stress. The physiology of stress in fish is exactly the same as it is in us and other mammals, leading to an increase in cortisol. This occurs via the hypothalamus, pituitary gland, and interrenal cells (the fish equivalent of adrenal glands). During last month’s Academy webinar, I covered this in great detail (see XXXXX <need link to last month’s webinar>). As with humans, cortisol causes immunosuppression, which can suddenly cause typically innocuous bacteria that are normally present in the environment to cause disease and even death. Next month, we will examine the environmental factors that can stress fish. Give some thought to this as you work with your displays in the weeks ahead. Make a list and compare it with my list next month. While water quality is definitely top of the list (and your list should include the parameters), there are several other important factors to consider as well. My Academy: How Do I Create a Custom Report Again? Has it been a while since you ran a custom report in My Academy, and you aren't sure you remember all of the steps? If so, there is a great helpful hint located right inside the program. Just go to left side of the screen and click reporting, then click on custom reports in the top right corner, then click create a new course, and from there you will see "How to Create a Custom Report." Click on the phrase and the helpful hint pops up. If you have information that is pertinent to all volunteers in all assignments, like your volunteer policies and procedures manual, place it strategically on your Volunteer Connection website in high traffic areas. For example, place it in your Resources section, so your volunteers can access it with one click. Here at San Diego Zoo Global we have a "Welcome Aboard!" discussion for new volunteers on our Volunteer Connection site, so we place the policies and procedures manual there, as well. Remind volunteers regularly that they have access to it 24/7, and to review it first whenever they have questions or something they can't remember. When they ask questions that can be found within your policies and procedures manual, remind them again that it is there for their review. "Constant repetition carries conviction" —Robert Collier. This quote holds true here: the more they hear it, the more you reinforce it, the greater the likelihood they will take it to heart. So be strategic and plan wisely. In this short course, a learner will be given a concise overview of Ergonomics—the Greek term for "the laws of work." What you need to know about keeping your back, neck, lower extremities, hands, and wrists injury-free is covered, with tips on the proper way to lift and what protective gear to wear to help prevent injury. Fitting the "job to the person" instead of the "person to the job" is what the science of ergonomics is all about. This course will allow learners to obtain the skills and knowledge needed to anticipate, recognize, evaluate, and control ergonomic risk factors in a broad range of workplace settings. Learners will also gain insight on OSHA guidelines, ergonomics stressors, common ergonomic injuries, and recommended solutions.